Be native to southeastern Pennsylvania. 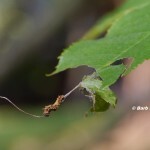 Offer high wildlife value and contribute significantly to your property’s web of life. Provide food for wildlife. Nutritious fruits, seeds, nuts, nectar, or pollen are produced by the plant. Most host insects that are eaten by birds or other animals. Offer shelter and places to raise young. Be easy to grow and make an attractive addition to your landscape. Wildlife Value: This medium-sized deciduous tree delivers exceptional wildlife value. 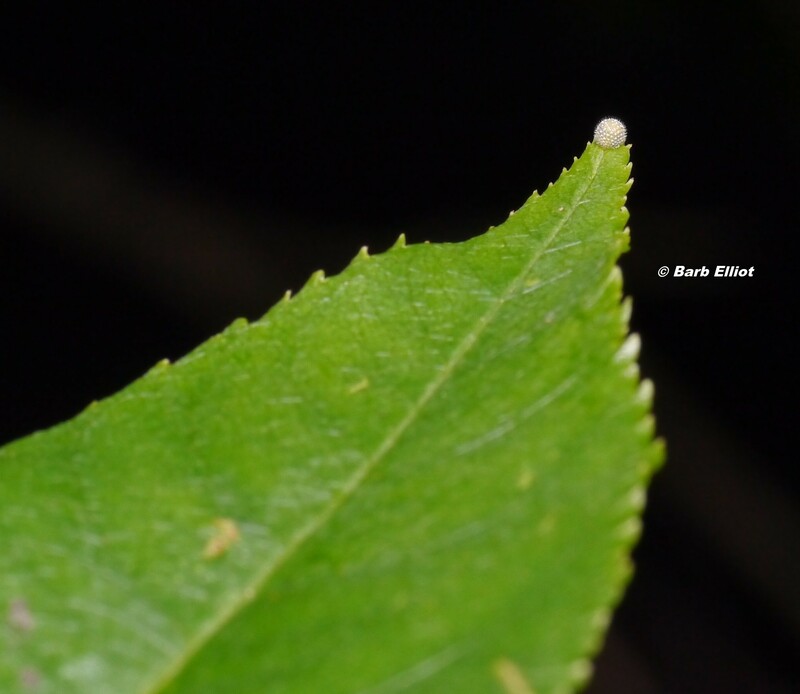 When the young caterpoillars emerge, the eat the cherr leaves. © Barb Eliot. Click to enlarge. 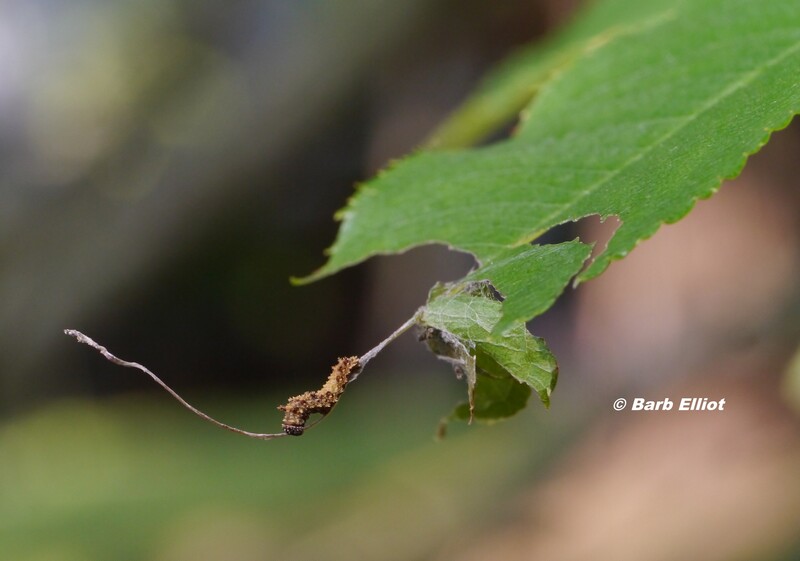 Red-spotted Purple butterflies lay their eggs on the tips of Black Cherry leaves. © Barb Elliot. Click to enlarge. According to Doug Tallamy, author of Bringing Nature Home: How You Can Sustain Wildlife with Native Plants, it hosts 456 species of moths and butterfly caterpillars. 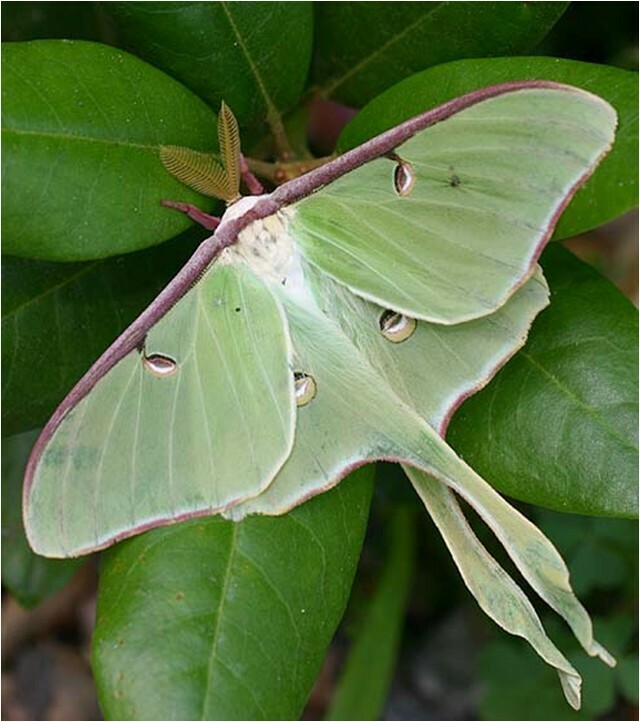 The foliage-eating caterpillars include Red-spotted Purple butterflies and moths such as Luna, Polyphemus, and Cecropia. The tree is not defoliated because many migrating and breeding birds including warblers, vireos, and thrushes feed on these caterpillars. Yellow-billed Cuckoos will eat Eastern Tent Caterpillars. 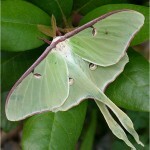 Luna Moth is another of the 456 lepidoptera species caterpillars that eat Back Cherry. Photo © Adrian Binns. Click to enlarge. 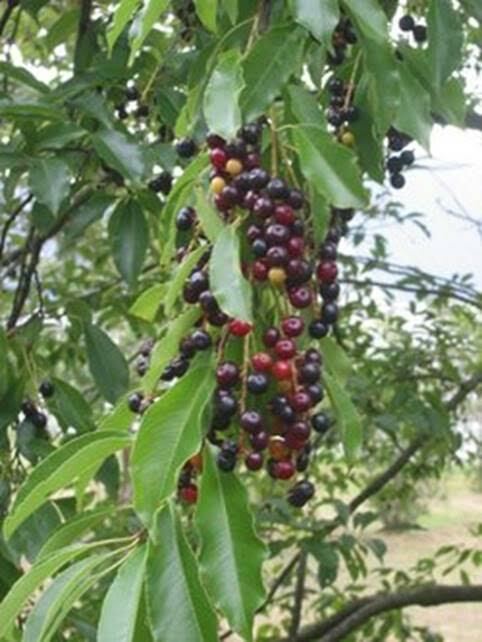 In late summer Black Cherry produces a copious crop of berries that are enjoyed by 33 species of birds including American Robin, Gray Catbird, Northern Mockingbird, Baltimore Oriole, Cedar Waxwing, and various woodpeckers. Native bees and flies pollinate the flowers. 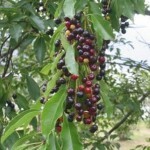 Many birds eat these Black Cherry fruits in late summer. Click to enlarge. Growing Conditions: Adaptable to a variety of situations, sun or part sun, dry to moist soil. Seedlings can be transplanted. Appearance: Medium to large fast-growing deciduous tree with dark, peeling bark. White flowers bloom in May on drooping stalks called racemes. The reddish-black fruits ripen in late summer. The Ruby-throated Hummingbird is the primary pollinator for Cardinal Flower. It’s long bill and tongue can reach the nectar deep inside the blossom. It’s head feathers pick up pollen from the anther. Photo © Barb Elliot. Click to enlarge. flower. The feathers on the head pick up the pollen and carry it from one plant to another. 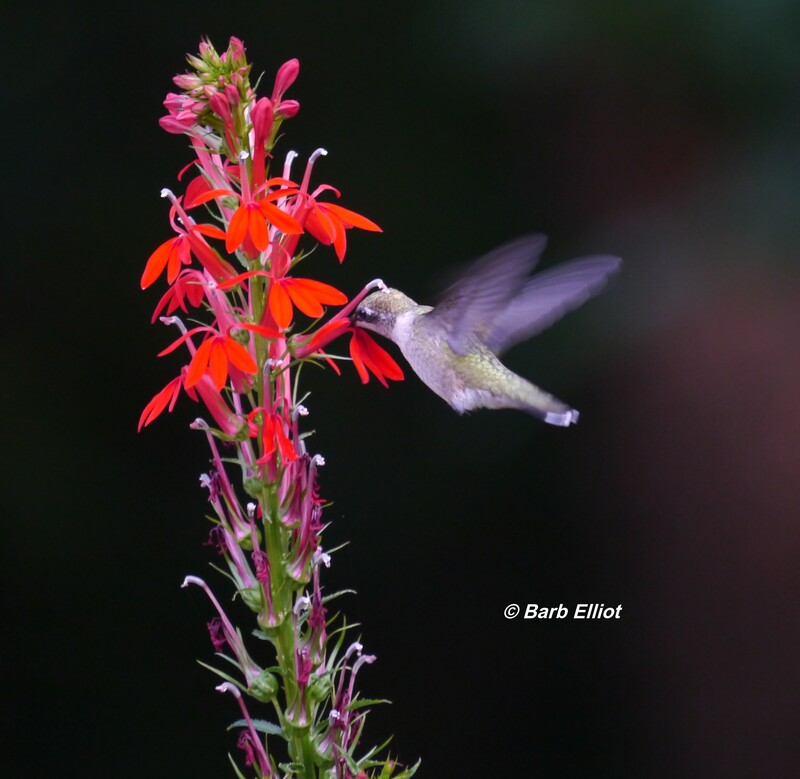 Cardinal Flowers bloom for six weeks in the late summer during the hummingbirds’ southbound migration. Bees rarely visit these flowers because their proboscis is too short to access the nectar. 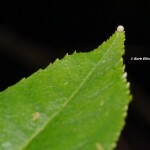 The Spicebush Swallowtail’s long proboscis can reach the nectar, but the pollen remains untouched. SCJack.blogspot.com photo. Click to enlarge. Large swallowtail butterflies can reach the nectar with their long proboscis but are unable to pick up and transfer the pollen. 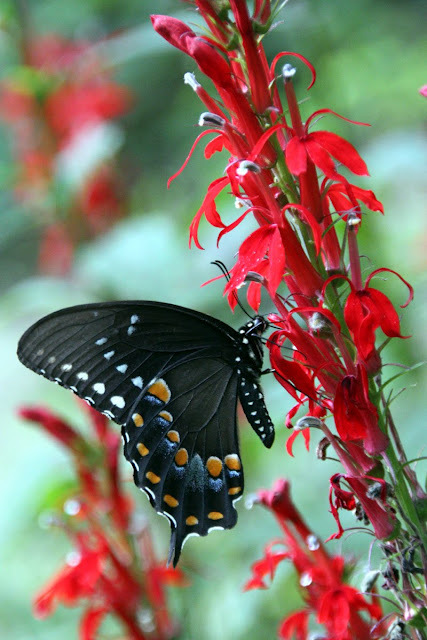 Growing Conditions: Cardinal Flower is a trouble-free perennial that enjoys moist soil. It will grow in average soil in a shady location. Not a true perennial, the plant and roots die after the growing season. However, the next spring it produces off-sets that will flower or can be transplanted to new locations. The parent plant also produces seedlings that can be transplanted. In the late fall, lay the flower stalk on the ground where you want seedlings to sprout in the spring. Appearance: The striking red flowers are arranged along 8” spikes called racemes. The plant grows 2 ½ -3 feet high. The flowers are attractive additions to flower arrangements. Collins Nursery, 773 Roslyn Avenue, Glenside, PA 19038. Native trees, shrubs, and some perennials. Spring and fall open houses. Otherwise appointment necessary. 215-715-3439 or collinsnursery.com. Edge of the Woods Nursery, 2415 Route 100, Orefield, PA 18069. Native trees, shrubs, and perennials. 610-393-2570 or edgeofthewoodsnursery.com. Gateway Garden Center, 7277 Lancaster Pike, Hockessin DE19707. Native trees, shrubs, and perennials. 302-239-2727 or gatewaygardens.com. Jenkins Arboretum, 631 Berwyn Baptist Road, Devon, PA 19333. 610647-8870 or jenkinsarboretum.org. Outdoor plant shop open daily 9-4 late April through mid-October. Redbud Native Plant Nursery, 643 West Baltimore Ave., Media, PA. Native trees, shrubs, and perennials. 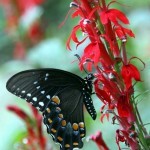 610-892-2833 or redbudnativeplantnursery.com. Russell Gardens Wholesale, 600 New Road, Southampton, PA 18966. Wholesale perennials, many native, sold to public. Pre-order for convenient pick-up. 215-322-4799 or russellwholesale.com. Sugarbush Nursery, 4272 Morgantown Road, Mohnton, PA 19540. Native trees, shrubs, and perennials. 610-856-0998 or sugarbushnursery.com. Yellow Springs Farm, 1165 Yellow Springs Road, Chester Springs, PA 19425. Native trees, shrubs, and perennials. Landscape design and consultation services available. Spring and fall open houses. On-line and phone orders available. Otherwise call for appointment. 610-827-2014 or yellowspringsfarm.com. Bartram’s Garden, 5400 Lindbergh Boulevard, Philadelphia, PA 19143. 215-729-5281 or bartramsgarden.org. Spring and fall sales. Bowman’s Hill Wildflower Preserve, 1635 River Rd. New Hope, PA 18938. 215-862-2924 or bhwp.org. Spring and fall plant sales. Brandywine Conservancy, Routes 1 and 100, P.O. Box 141, Chadds Ford, PA 19317. 610-388-2700 or brandywine.org/conservancy. Mother’s Day weekend. Seeds also available. Delaware Nature Society, Cloverdale Farm Preserve, 543 Way Road, Greenville, DE 19807. 302-239-2334 or delawarenaturesociety.org. First weekend in May. Pennypack Ecological Restoration Trust, 2955 Edge Hill Road, Huntington Valley, PA 19006. 215-657-0830 or pennypacktrust.org. Spring and fall plant sales. Schuylkill Center for Environmental Education, 8480 Hagys Mill Rd., Philadelphia 19128. 215-482-7300 or schuylkillcenter.org. Spring and fall plant sales.